I eat a lot of Indian. My favorite by far and away is Aaapakadi - Sunnyvale. Yes, virginia, there is a sunnyvale. One of the locations ( the larger ) is easy to reach from 85, so if you are taking a freeway through the area, it’s an amazing stop - like if you’re going to Los Gatos or Santa Cruz by car. You will be eating like a local there, and there is no dumbing down of the food. I can honestly say there is literally nowhere I am excited about between Burlingame and San Jose. Aren’t your first two paragraphs contradictory? I’d say in general its definitely harder to find places to be excited about in the Peninsula and the Valley, versus places like Oakland and SF. But they are there if one looks past the restaurants covered by the media there are some gems that are just as good if not better. Sunnyvale, Milpitas, etc. is a gem for Indian. I think the Tristate area has a higher population from the Indian subcontinent. But the concentration of regional specific (not general curry house) Indian restaurants around SV/ MP is unmatched anywhere in the US. Just not a lot of people pay attention to it outside of the valley tech worker population. There are good stuff other than Indian too- Iroriya, Nagi, Napoletana, Giac Minh, Chef Z (part of menu), etc. There are some that are not necessarily in my exciting category since its not my most preferred cuisine category, but should hold their own. Noodle Talk for example should compete with Wojia in Albnay just fine. And I haven’t even explored the Korean and Vietnamese areas much. We are just not in the well-covered food part in the Bay Area. If Jonathan Kauffman, Luke Tsai or @Hyperbowler lives down here, or if Mercury News has a better food section, then we’ll get a bit better reputation for the eats we have down here. Yep, my first two paragraphs are contradictory. If I was being paid for the text, I would have spent more time editing. Thanks for the catch. I really don’t need a nobu-alog, or another in the Reposado chain. The places I am excited about eating in are Fremont ( under covered and rapidly on the rise ) and greater sunnyvale / saratoga. However, due to traffic around dinner time, it’s hard to get to those areas before about 8pm. A new chettinad place opened just north of 85 on ECR, but it’s not recommended, so I haven’t even remembered the name. What are you eating in those places? Annachikadai? I liked that place enough. What don’t you like about it? Where am I eating… sampling around. I remember a fun meal at “K-Pop” restaurant. Lots of 20-somethings, fried food, sojo for days. Smoking pig now and again. Booniepepper once. Mumbai Chowk a few times. Malaikottai chettinad, didn’t even seem chettinad. There was a place with szechuan fish I went to a couple times - can’t find it on the map, don’t know if it made it. Some korean place I watched one of the warriors finals games last year - peculiarly in the middle of a field of construction. A chinese place up by Niles ( in the flats where the restaurants are ). One of the very old school burger places which was a little scary. Everything’s fun and good food and relaxed, nothing quite to write home about ( except Mumbai Chowk, which I’ve written about before ). Nothing really worth trumpeting, but I love the area generally. Annachikadai has a short menu and only average quality compared to Appakadai. Appakadai has things like Nethili Fry and appams and crab and a better selection of drinks. The only thing Annachikadi has going for it is the banana leaf, which you can also get across in the bay at Anjappar. Appams are great generally and theirs are pretty good. I asked a few indian friends and they agreed. The tastes weren’t quite in balance and vibrant. In fact, we didn’t finish our chicken 65, and I love some chicken 65. It was more like nuggets. You said “I liked them fine”. I liked them fine too. But I LOVE our other options. I’ll also go to Himalyian Kitchen, that’s only a few blocks away, of which the only problem is they run the A/C too high. Other than that it’s perfect - even better for buffet. Without buffet, you get one dish that’s too spicy, you’re toast. Himyalian is right on my spice tolerance zone, which is about 20% higher than my girlfriend, which means if we are ordering ( not buffet ) I have to eat 100% of any spicy dish. Somewhat deadly. Buffet you can have a bite of each and go back. The service wasn’t as good either at Annachikadai, but that was a single visit and I won’t judge them based on that. Nor the decor, which is frightening. The prices are lower, that’s about the best you can say. In some sense, it was kinda like going to Chennai Kings, the dosas there aren’t just in parallel to the others in the area. If I lived in Montana, I would be at Chennai Kings every day. We were surprised by how meh we found the brews at Cellarmaster four years ago. Perhaps things have picked up? Also could you say a bit more about the burger at Tempest. As you may recall, I am obsessed with finding burgers when I go to the States, because your restos can actually cook them mid rare (heaven!) instead of puck. I do prefer a simpler burger even so (no truffley bits!) unless maybe it’s the Mission Bowling burg. Swoon. TIA. Greyelf! It’s been so long. Good to converse. Well, beers in the bay area. I did a 100 beer crawl about 6 months ago, and found ALL the beers meh. Partially I don’t like the new style (“east coast IPA” / “Citra IPA” ), partially I think these people are just throwing up breweries without knowing much. Cellarmaster was the best of a super-meh crop thus may have been buffed by average competition. The trick in these tastings, I have found, is to get “sampler of everything”. This will be 10-ish 4 oz pours, which is 40oz of high proof beer, and when split among two then only have a sip of what you don’t like, maybe cuts you down to the same as a pint. With Cellermaster, I think we had both the worst beer of the 100 and the best. That I can get behind, taking some risks, which is why I recommend them. Regarding the Tempest burger. It’s a pretty no-nonsense bar in an alley, with a window for food ( the box? ), and you can order at the bar when they’re not slammed ( they’ll put up a sign and you have to order at the outside window and bring it inside when they get too busy ). The burger is pretty tall and juicy, with minimal fru fru, good juices, about everything you would like in an all-american burger. I will not claim it is the best in the city by any means, but I think they could place themselves in the top 20 or so. Far above super duper, which is a mass market hamburger. Where else are you going to get a burger around there? Marlowe? That burger is twice the price and a similar quality and it’s hard to get into marlowe. Of course us locals will put price into the mix when a traveler might not. But it really is more of a local’s everyday place, perfect for lunch, too crowded to have dinner at, unless you get a table early and like 20-somethings having their 6pm after work beers. Speaking of beers, if I was right around there, there’s a beer store that has good stuff. City Beer. The best spot there a 4pm, 5pm stop when you’re finishing whatever museum you were at. Sometimes we find a beer there that we don’t find elsewhere. They don’t have food, so it has to be a quick stop. San Francisco brewery specializing in hop-driven beers. Tasting room at 1150 Howard Street. Cellarmaker House of Pizza at 3193 Mission St. Thanks, Slide, that is pretty embarrassing, considering I was just looking at Cellarmaker’s website this week to decide if we wanted a revisit. I can’t figure out how to edit my post with the error, alas. Hey Brian, it has been a minute, hasn’t it? I’ve been afraid to diss the beer scene in the Bay Area too much but we really haven’t been impressed either in the past, apart from some good sours. The SO is pretty keen on those hazies but there doesn’t seem to be anywhere doing standout versions in SFBA, unlike Portland which is overflowing with them. We are very fond of trying samplers as you describe. We have indeed visited City Beer and loved it. Burger in bar sounds good to me! We like to do burgs at happy hour (even if they’re not on special) and split one along with a tasty beverage each. I didn’t hate Super Duper but haven’t rushed back. We did try the Marlowe burger way back when and found it decent but pricey even then. The only for-sure burg so far is the Mission Bowling Club one, which is frou-frou but in a good way. Is there somewhere you’d go out of your way for if you were a deprived-of-mid-rare meat eater like moi? re: SF beer scene, you don’t have to worry about dissing it to me. I’ve done trips to seattle and portal recently and did a lot of drinking and and I said I was not impressed with SF in my 100 beer crawl. I did have a good Cellarmaker beer though - a friend bought me a growler of their IPA, and for a hazy beer it was pretty good. Depth and multiple tastes. The favorite from the crawl was one of their barrel aged. re: Burger. Let’s see. I am still fond of Mua in Oakland. Part is the scene, part is the burger, but it’s a good burger, and of the style you like. I am very fond of Refuge in San Carlos, because they have the pastrami burger and a very pleasant beer selection, but they like to do medium well and it’s hard to talk them into the kind of burger you’re talking about. It ends up juicy, so I don’t mind — but you would if you went all the way to San Carlos you would — but the pastrami burger is a thing of beauty ( the mole burger also but if you’re having one burger make it the pastramiy ). I would send you all the way there for the pastrami burger. The clever person looks at the beer list next door at Ale Arsenal and the beer list at Refuge and chooses the location based on the beer - AA allows you to bring your pastrami over. AA is an excellent member of the “beer scene” and always has good events during beer week. That’s not to say you’ll like the beer. Fogey that I am, I liked Oakland better than SF 20 years ago, and now a days, Oakland is like the SF of 20 years ago and SF now is insufferable. I happen to be doing more public art up there ( check out the big sculpture in Hayes Valley, I’ve been doing some work with the person who did that, Charlie ), which means I’m up there more. I tell all my friends to take the ferry over to Oakland, make an eating plan for the evening in oakland ( you can trivially have 4 interesting meals there, let alone the great bars ), then take the ferry back ( or the bart if it gets late ). Ferry ride at sunset is such a nice way to start an evening. The hard problem before was transport, now we have Lyft and it’s just not. The public bicycles and scooters too, everything is close. If I think of more favorite burgers, I’ll report back. City Beer has moved a couple blocks away, it’s on Mission now, instead of Folsom. There’s a kitchen there and they intend to have food, but they were having problems right after they opened, so I’m not sure if that part’s open yet. New location is a fair bit larger than the old one and has some outdoor seating as well. 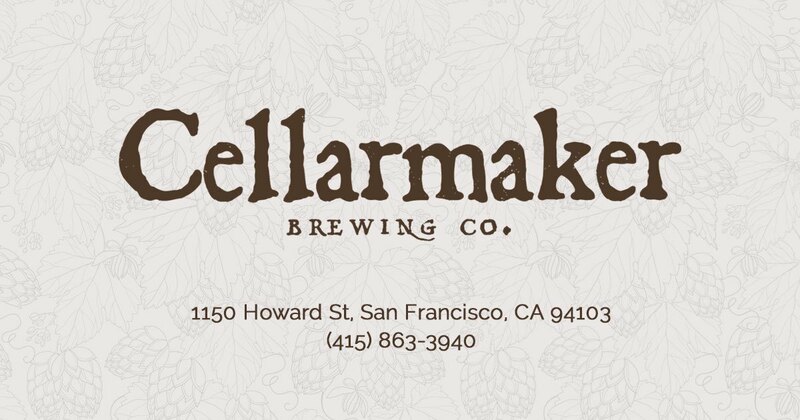 Cellarmaker does do a number of well regarded hazy IPAs, but the better ones tend to sell out pretty fast, so it’s always hit or miss as to what you’re going to get there. I think they’re ramping up the sour production, so they have a bit more variety than they did a few years ago, where you basically had your choice of IPAs and like one or two other things. That said, my biggest issue with Cellarmaker is that it’s always crazy busy at night. They open at noon on Friday and you can bring in food (there’s a pretty good bakery next door, and Deli Board a couple blocks away), so that’s my preferred way of going. They’re also distributing and canning more than they used to, so there’s a certain amount of availability at other bars, but not nearly as much as at the actual location, of course. On the burger front, I think Monk’s Kettle can do a relatively pink one. I know Hog & Rocks could, but they’re closed now. Temple Club is interesting. Kinda similar to a couple of chefs in Portland, who went to Thailand and Georgia, respectively, and wanted to recreate dishes back at home. We haven’t had the best luck with Vietnamese in SFBA, apart from the dear departed BoDeGa. Nyum Bai is on our list for the amok. Must get this dish, as I love it and it is hard to find. I am a weirdo when it comes to a lot of Middle Eastern flavours/dishes. They just don’t grab me, with a few exceptions (eg) Turkish manti.